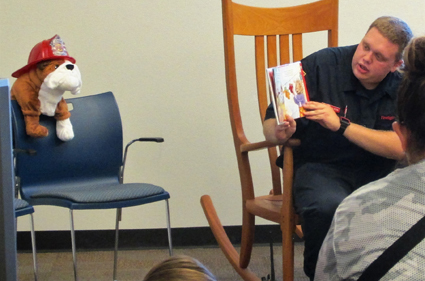 Artesia Fire Department firefighter Preston Wilson reads “Sparky the Fire Dog” to a standing-room-only crowd June 6 during the Artesia Public Library Summer Reading Program’s inaugural Community StoryTime. Afterward, young attendees were escorted outside for a close-up look at a fire engine and ambulance. Community StoryTimes continue to take place at 10 a.m. each Tuesday at the library and feature a different local organization every week. See what’s coming up at the library by keeping an eye on the Daily Press’ Around Town section.